It’s been about a month since I first picked up my Sprint HTC EVO 4G at Google I/O 2010 and since then a few things have happened. First, I warned prospective buyers of the HTC Droid Incredible for Verizon Wireless that the device would become outdated quickly. And it did. While the Incredible is by no means anything short a top-notch smartphone, the HTC EVO 4G is definitely a game changer. Second, Apple announced the Apple iPhone 4, which now has tallied nearly 600,000 pre-orders. But while the iPhone 4 may have many stunning features, everything from Sprint’s reliable network and affordable calling plans to HTC’s support for unrestricted video chat, HDMI output, Android Froyo v2.2 (coming soon), and a mobile hotspot feature makes the EVO 4G worth every penny. 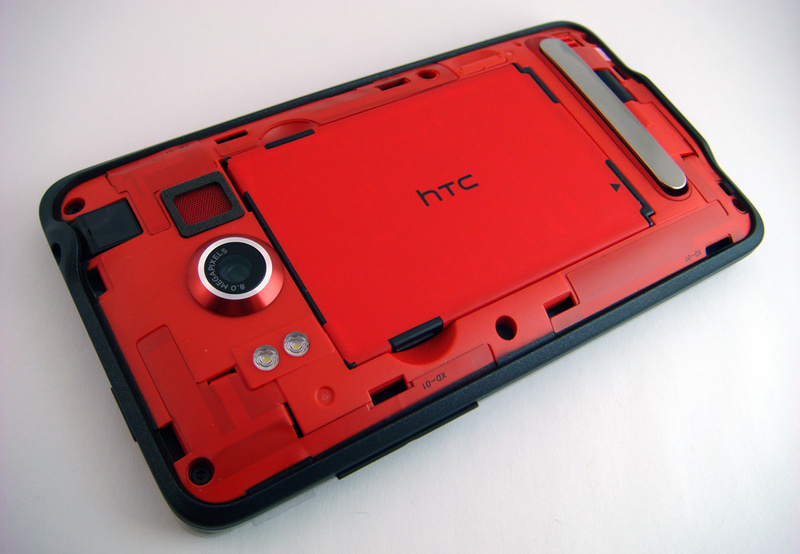 If you thought the Droid Incredible was “incredible”, then the HTC EVO 4G will blow you away. It packs a similar set of features including a Qualcomm 1GHz Snapdragon processor, 512MB of RAM, an 8 megapixel camera, a GPS module, Bluetooth v2.1, FM Radio, WiFi b/g, HTC Sense UI, and dedicated touch keys. However, there are a few differences. For instance, the HTC EVO features 1GB of ROM, twice that of the Droid Incredible. It also features an additional front-facing 1.3 megapixel camera for video chat. And, as with just about every smartphone, HTC also includes an accelerometer, a proximity sensor, and an ambient light detector. To top it all off, the Incredible runs on Android 2.1 with HTC’s Sense UI overlay. While the Droid Incredible has a familiar size, the HTC EVO is monstrous. It sports a 4.3 inch screen and weighs 6 ounces, making it larger and heavier than most smartphones. In comparison, the ever-so-popular Apple iPhone 3GS features a 3.5 inch display and weighs just 4.8 ounces. 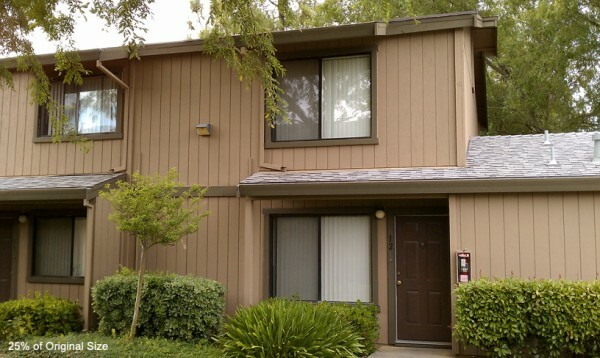 While the differences may seem considerably large, it really isn’t an issue. It’s by no means bulky. It’s nothing like the HTC Touch Pro 2, which is sadly nothing more than a Windows Mobile paperweight. The EVO is still small enough to slide into most pockets or store in a purse. That’s mainly because it’s still just about as thin as both the iPhone and Incredible. Did I mention the EVO looks stunning? The glossy black finish and silver linings for the touch keys, earpiece, and kick stand is sure to catch a few eyes. As for ruggedness, while dropping this phone would be disastrous as it would be with any expensive gadget, it should still easily survive a few years of reasonable wear and tear. The front of the phone sports the large 4.3 inch display below the 1.3 megapixel front-facing camera, and above four touch sensitive buttons: Home, Menu, Back, and Search. A standard microUSB port and a mini HDMI port are on the bottom of the EVO. The power/lock button, which is on the top, is unfortunately a bit cumbersome to use since it’s too flush with the casing. If it stood out a tad bit more, like the volume rocker on the right side, it wouldn’t have been as much of a problem. For music junkies, a traditional 3.5mm headphone jack is on the top. The back side of the EVO features a kickstand, the famous 8 megapixel camera lens beside its dual LED flash and a speaker. The back plate, which I should note is cumbersome to remove, reveals a 1500 mAh user-replaceable battery. 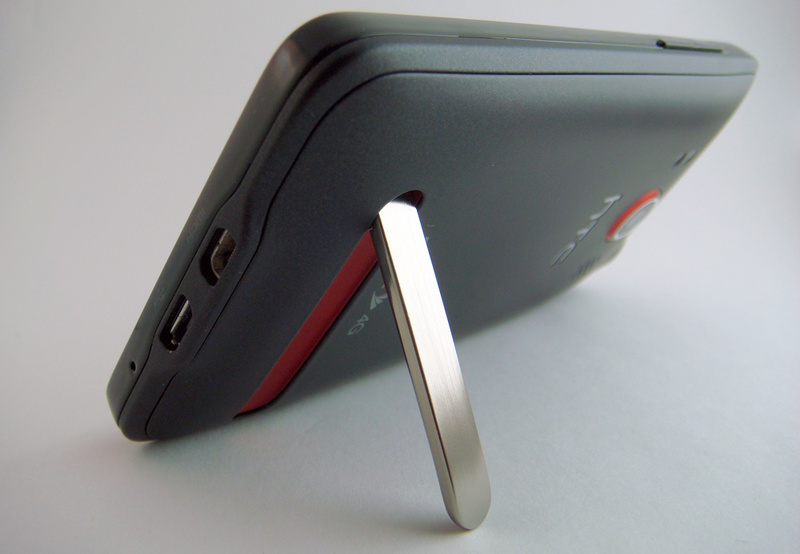 The microSD slot is poorly placed beneath the battery, making it difficult to remove. My only major gripe was with the camera that protrudes from the body, which can potentially cause damage with extended use. 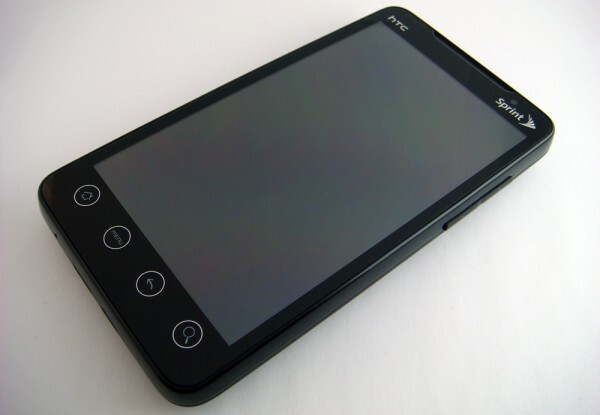 The HTC EVO 4G features the same 480-by-800 pixel screen resolution as the Droid Incredible, but its screen is over a half inch larger, which results in a lower pixel density. The screen is also a standard TFT display as opposed to the AMOLED that powers the Incredible. Interestingly enough, I found the EVO’s image quality a better representation of natural colors. While I had complaints about the Incredible’s outdoor visibility under direct sunlight, it’s not nearly as much of a problem for the EVO. The ambient light sensors do a great job adjusting brightness to the appropriate levels. As for the performance of the EVO’s capacitive touch screen, it’s actually impressively responsive and accurate. If there were one suggestion I’d make for future improvement, I’d have HTC upgrade the display to feature more than just 65K colors. Competitors such as the Apple iPhone 3GS and Motorola Droid already offer 16 million colors. Although most users won’t notice a difference, it’s somewhat recognizable when placed side-to-side. For those considering the iPhone 4, the Retina display that sports 960-by-640 pixel resolution on a 3.5 inch display is light years ahead of the EVO. While I generally would walk through the Android OS’s features, I’ll suggest reading the “Interface” part of my Droid Incredible review. Why? Because they’re nearly identical. The EVO features all the same goods, including the HTC Sense UI overlay, seven home screens, an “expose view,” a variety of pre-installed widgets, social networking features, live wallpapers, and much more. It’s a huge improvement over Google’s native Android interface, which is rather dry. If there is any major distinction between the Incredible and EVO, it would have to be Sprint’s inclusion of an extra Sprint applications and widgets. For the most part, the EVO’s interface is a few steps ahead of the iPhone OS, WebOS, BlackBerry OS, and Windows Mobile. Apps were scarce when I first dove into the Android Marketplace in late 2009 shortly after the launch of the Motorola Droid. Today, Google’s app store features over 50,000 applications created by over 180,000 developers. Android is now undoubtedly attractive enough for companies to invest resources for building apps for it. Early Android Apps weren’t as polished as iPhone counterparts either, but that’s no longer the case. Within the first few days with the EVO, I downloaded apps for all the services that I regularly use: Amazon, Barcode Scanner, Digg, Dropbox, eBuddy, Flickster, Google Voice, Mint, Pandora, Photoshop, Qik, Shazam, SpeedTest, UrbanSpoon, and WordPress. While the iPhone may still offer a larger selection, I wasn’t missing out on anything major by switching to the EVO. Although my favorite Skype app was missing, we all know that that is coming later this year. I even got access to SlingBox’s Android version of SlingPlayer, which is still in beta. While I was happy to say that the Droid Incredible has one of the first non-iPhone touch screen keyboards that work, things only get better with the EVO. Why? Mainly because of it’s enormously large display. Especially when in landscape mode, keys are large enough that it’s nearly impossible to mistype anything. Plus, with auto-correction and custom dictionaries, typing is a breeze. The keyboard interface often takes a split second longer than it should to load, however, once ready, it’s incredibly responsive. Unlike the iPhone, the EVO offers haptic feedback while typing. While I was annoyed with the Incredible’s inability to keep the micro-vibrations synchronized with my fast-paced typing, it works seamlessly on the EVO. The main keyboard view offers alphabets only, however, holding down on a letter for a second activates a grayed-out symbol or number. A “12#” button also brings up the dedicated keyboard for punctuation and digits. The latest version of the Android OS also offers built-in voice dictation for any text field that uses the phone’s native keyboard. My test runs were impressively accurate. While I can’t see myself using it on a regular basis, it will come in handy if you need to dictate a text message when juggling too many things at once. The upcoming Android Froyo v2.2 adds further accuracy and performance improvements to dictation. It will also bring additional keyboard improvements too. Facebook, Flickr, Twitter? No problem. These social networks are all built into the Sense UI by default. One quick login from the Accounts and Sync menu will automatically integrate the service into the phone. Contacts are instantly downloaded and merged with existing contact cards. These cards display SMS messages, Email threads, status updates, photos, and call history in tabbed view. Google Accounts even supports syncing multiple IDs. I was quite impressed with the Motorola Droid’s social networking integration last year and although there aren’t any revolutionary changes, HTC’s Sense UI offers many improvements. The upcoming Froyo update will bring further advancements with native support for synchronizing these networks. Getting real work done with the HTC EVO‘s 4.3 inch screen is a breeze. Google’s Gmail client is robust and loaded with desktop-like features. Keeping informed isn’t a problem, since push notifications deliver alerts quickly. The SMS application has a great threaded message view to keep track of conversations. The Calendar application also works great for viewing multiple calendars. The built-in web browser renders pages faster than the iPhone’s mobile Safari browser over the same WiFi network. The Flash Lite is helpful, but it doesn’t get any closer to supporting services such as Hulu. The tabbed browsing interface helps improve multitasking; it does, however, require two clicks to view open tabs, which can be a nuisance. Fortunately, other third-party browsers like Opera, Dolphin HD, and Skyfire are available for download through the Android Marketplace. Since the EVO supports saving files on both internal and external storage, it’s easy to view documents through the PDF viewer and QuickOffice. Additional tools such as Dropbox makes life even easier. While it may not be clear at first, the EVO’s large display also makes a vast difference when it comes to read text-heavy content. The HTC EVO 4G features an 8 megapixel camera with auto-focus and dual LED flash. The snappy processor and hardware launches the application within 2 seconds. The Sense UI interface offers adjustments for brightness, contrast, saturation, and sharpness. Some included effects are grayscale, sepia, negative, solarize, posterize, and aqua. Also available are basic controls for configuring White Balance, ISO, resolution settings, self-timer, and geo-tagging. Images look great in well-lit areas; however, they begin to appear “grainy” in low light conditions. While the dual LED flash should technically help, close-range images taken in the dark appear overexposed. As for video quality, the EVO truly does record at a native 720p resolution. Although that number may sound amazing, keep in mind that the quality isn’t on par with a dedicated HD camcorder. Compression artifacts and occasional drops in frame rates are obvious. While the EVO’s camera won’t be replacing a dedicated point-and-shoot anytime soon, it’s still probably the best camera phone on the market. If there were one other request for a future hardware iteration, it would be to include a dedicated shutter/capture key. 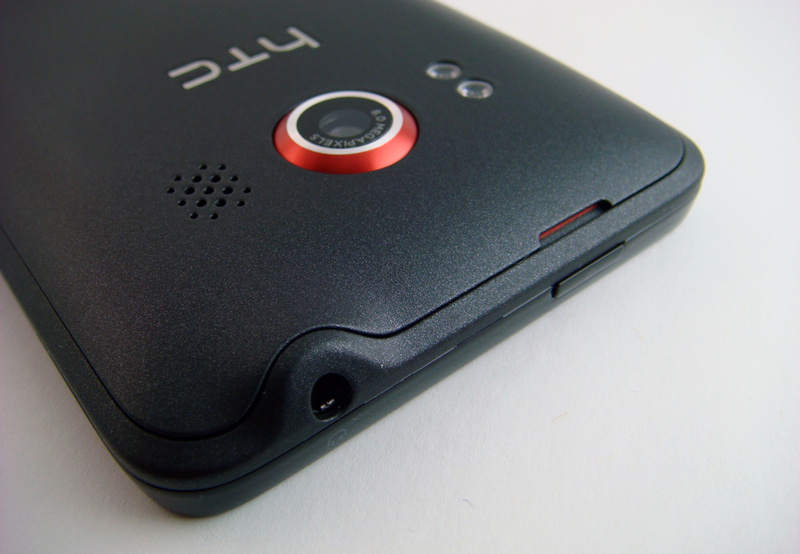 If you didn’t notice, the EVO sports a 1.3 megapixel front-facing camera that caters to one primary purpose: video chat. Although it’s also great for snapping self portraits, the idea of being able to share two-way video with another person is revolutionary. While Sprint partnered with Qik for video chat, other applications such as Fring utilize Skype’s protocol to reach an even larger user base. Qik is great, but since only HTC EVO 4G phones have the two-way feature, it’s not very useful as of now. Skype’s Android app is slated for later this year and it should hopefully bring mobile video chat support. As for Fring, while I personally wasn’t a fan of the user interface, it did manage to host a video call with my family running Skype on their iMac desktop. While there was some lag for both audio and video, it still worked. Apple’s FaceTime for the iPhone 4 is being touted as revolutionary, but it’s restricted to users with the same hardware and a WiFi network. On the other hand, the EVO can run video chat on 3G, 4G, or WiFi networks and communicate with any device. 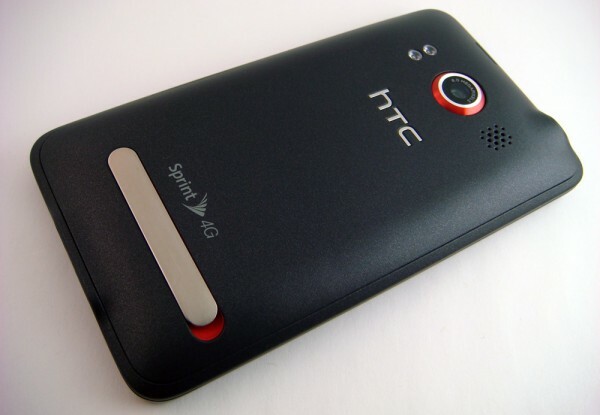 Although the HTC EVO lacks the 8GB of internal storage that the Incredible packs, it still offers up to 32GB microSD expansion. Sprint and HTC even throw in a 8GB card to get users started. It still has just as much storage as the largest capacity iPhone 3GS and iPhone 4. 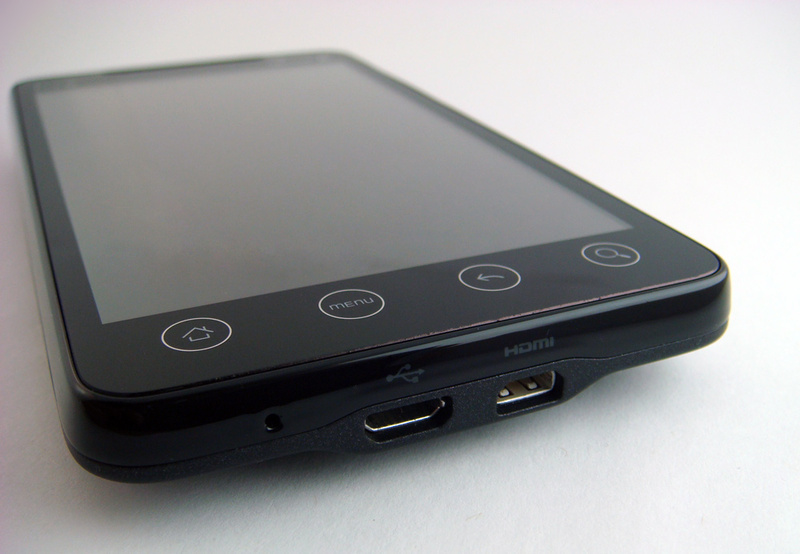 The EVO 4G connects to Windows 7 or Mac OS X machines with a microUSB cable and appears as a mass storage device. Syncing content by dragging files or folders onto the device is a breeze. The Android OS automatically detects, indexes, and adds new files to the library after sync. Programs such as Windows Media Player 12 also play well with the phone. DoubleTwist, a relatively new application, is even slowly paving its way into becoming a viable iTunes alternative. When it comes to video, the EVO’s large display sets it apart from other smartphones. With an over-sized screen, it actually begins to enter the territory of tablet devices such as the Apple iPad or Dell Streak. The Snapdragon processor easily handled playback of high-resolution H.264 content. This includes most videos tagged as HD on the iTunes Podcast library. Content from TED Talks and Revision 3 ran smoothly without any pixelation, pauses, or buffering. While colors were over-saturated on the Incredible’s AMOLED display, it’s not an issue with the EVO. And for HDTV owners, there’s also a HDMI output on the device, but a cable wasn’t included. The audio experience is also well-integrated into the device. The music player allows users to browse through their collection by artist, album, playlist, song, genre, and composer. The interface shows album artwork (if embedded into the file) whenever possible, and a cover flow view appears when playing music. There are also modes for shuffle and repeat. The application can continue to run in the background and the status appears in the notification bar. Other apps such as Pandora also take advantage of the background multitasking capabilities. Widgets offer control and access to the music application without ever needing to leave the home screen. The built-in mono speaker is impressively loud and clear. Audio is crisp and doesn’t begin to crack when reaching max volume. It can get loud enough to overtake most phones I’ve tested, including the Motorola Devour, Apple iPhone 3GS, and Palm Pre. Since the EVO doesn’t have a set of stereo speakers, the best experience is still achieved with a pair of headphones. Unfortunately, HTC doesn’t include a pair. It’s a rather odd decision, since the phone features an embedded FM tuner that won’t work without a pair of wired headphones plugged in as it’s also the antenna. But on that note, the FM radio feature is a great addition since it doesn’t consume nearly as much power as applications, such as Pandora, that need WiFi or 3G. I hadn’t spent much time on Sprint’s network until I got my EVO. I’ve been a long time Verizon fan and have had my fair share of issues with AT&T’s network. Surprisingly, the EVO 4G held up very well on Sprint’s 3G network. However, the real test came when I had to heavily depend on the phone for E3. My usage included a 6 hour, 340 mile drive from San Jose to Los Angeles and back, plus 3 days of press conferences and time on the convention’s show floor. Starting with call quality, Sprint’s network was amazing. AT&T’s network often results in repeated dropped calls where Sprint ran perfectly. Calls sounded clearer on the EVO than on the iPhone 3GS without the slightest hint of static. The microphone driver is also better, as listeners on the other end could hear me better than ever before. Friends and co-workers immediately asked me if I was on a new device. While Sprint’s coverage isn’t as vast as the other two larger carriers, it hops onto Verizon’s network in roaming mode behind the scenes, without any additional charges. I didn’t experience a single dropped call during my entire drive, and just one in a packed press conference. Also heavily used during my trip was the built-in Mobile Hotspot feature. I had it enabled during my drive so that the other two passengers could browse the web over a 3G-powered WiFi connection. While speeds and ping times often slowed down due to driving at nearly 70 miles per hour, it still maintained a connection of about 400 kbps for both download and upload. When back in the Sacramento area or the San Jose area, speeds held consistent at about 1.2 Mbps for download and 0.8 for upload. Sprint charges $29 per month to enable this feature in addition to the regular calling and data fees. 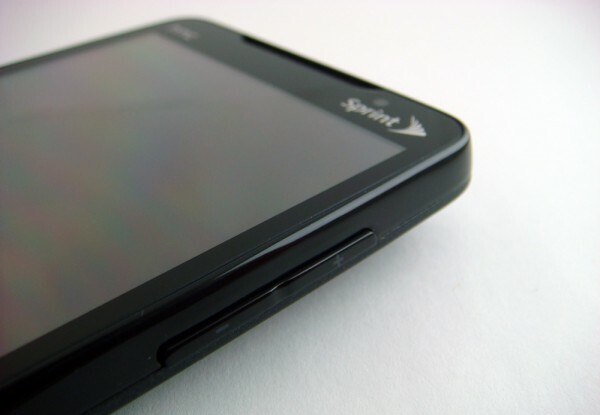 It’s expensive, but also half the price of the monthly plans for a Sprint Overdrive 4G. And as an added bonus, unlike competing service providers, data is entirely unlimited on both 3G and 4G networks. Although I had about 3 netbooks paired to the EVO at a time for live-blogging, it supports hosting a connection for up to 8 devices. While 3G speeds aren’t enough for too many devices, 4G would do the trick. When it comes to battery life, in some cases, the EVO is a disaster. Let’s take my road trip, for instance. I had the phone mounted to my windshield cradled in a Wilson Electronics Sleek Signal Booster running Google Navigator for turn-by-turn directions, playing music from Pandora, and using the Hotspot feature for others in the car. I even paired a Bluetooth headset with the EVO to make occasional calls. Unfortunately, the phone began getting really hot due to CPU intensive tasks and direct sunlight. I felt that it was draining battery faster than the car adapter could charge it. If I hadn’t brought a charger with me, I would be lucky to get 1-2 hours of run-time with the internal battery. Even on the show floor battery life was horrible. With intensive usage where the 3G network is cluttered and sporadic, sending text messages, checking emails, browsing the web, checking calendar meeting times, and getting occasional directions would drain the phone within 4 hours. But let’s put all this in perspective. If I were to have only used the features that other smartphones such as the iPhone 3GS offered, the battery life on the HTC EVO would be on par. HTC claims about 5.2 hours of talk time with the included 1500 mAH replaceable battery pack. Although the company also advertises about 6 days worth of standby, that’s likely a rarity without manually disabling auto data syncing, background applications, and wireless networks. Using extra features such as the Mobile Hotspot or Google Navigator will drain the EVO’s battery life rapidly. However, avoiding overkill multitasking will let the EVO make it through a day just fine. I was also glad to find that the included AC Adapter was also a modular microUSB cable. Android even bundles a great tool to monitor components of the phone that consume the most power. It revealed that the Android OS consumed the most power followed by the cell radio and WiFi network. In my E3 situation, I choose to carry around a portable USB battery pack such as the one we reviewed from Proporta or Zagg, which offers nearly 3-4 full recharges. 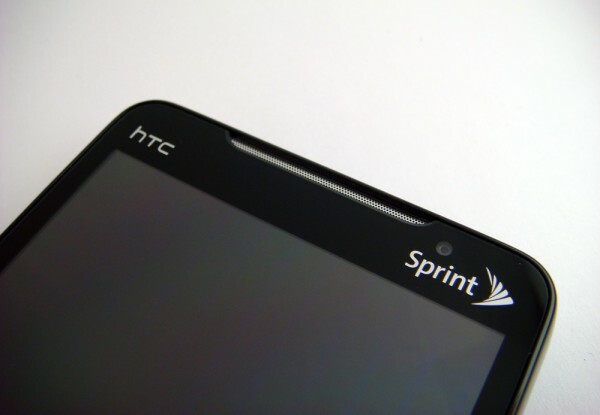 With ground-breaking hardware, an affordable network, and a great operating system, the HTC’s Android-based EVO 4G for Sprint is likely the most powerful smartphone on the market. While some may argue that the iPhone 4 is better, each has its own pros and cons. Everything from the simplistic design, the top-notch configuration, the extra Sense UI addons, the ever-growing Android Marketplace, and Google’s free GPS Navigation make the EVO worth every dime. While battery life may be a deterring factor to some, avoiding over-using special features such as HDMI, Mobile Hotspot, Video Chat, and Navigation will offer reasonable battery life. Also, Sprint’s calling plans are nearly $15 cheaper than Verizon’s network and include mobile-to-mobile calling to anyone on any network and unlimited texting. While AT&T’s iPhone 4 plans now go for as little as $55 per month, users are restricted to 200 MB of data per month. Sprint’s stance is unlimited, which is great for customers. If you are looking for a new smartphone, you can’t go wrong with HTC EVO 4G. It can do everything you want, plus more. [Link Removed] guide to battery saving tips saved my phone. All of the full time auto syncing really wears down The battery. It would die at around 230 daily until the 20 tips were posted, not my EVO lasts all day. Love love love my EVO, I CAME FROM A T-MOBILE BLACKBERRY and my wife just switched from the iPhone after playing with mine after a week and she cancelled her iPhone 4 Preorder….35 minute process. A must have. i really think christmas would be the best time to buy an android. the google would by then come out with their 2nd phone with gingerbread and it’s features will most prob. be the culmination of their yr’s acquisitions. im holding out til then. iPhone will be releasing the 4G version very soon, if you are buying for Christmas you might want to give it a thought. The display on my two week old EVO went black four days ago due to a mechanical defect. After spending hours on the phone with Sprint and being transfered to person after person in multiple departments over a two-day period, the issue still isn’t resolved. In summary, Sprint is not holding back any EVO inventory for defective phone replacement. During my third connection to an overseas call center, I was told that the phones are out of stock, that they don’t know when more will arrive, and that I’ll just have to keep calling them back every twenty-four hours, just like everyone else, to check to see if they’ve received a delivery. They will not submit an order to hold a replacement phone for me when they’re restocked, so it’ll be the luck of the draw if I happen to call before the next shipment sells out again (I’m told they’re flying off of the shelf – too bad Sprint is more interested in selling new phones and new plans than in taking care of their existing customers.) During my last transferred connection with India yesterday afternoon, the gentleman, who I could hardly understand due to the thick accent and who was very scripted during our conversational exchange, told me I should add a third phone to my service and buy a spare EVO to have on hand to use in case mine breaks again, followed by him trying to sell me Sprint internet bundles for my computer. Unbelievable. This is my fourth day being phoneless, paying for an expensive phone/data plan that I can’t use, waiting to call India again at 3:00 this afternoon to see if more phones have arrived… BTW – Sprint will not issue a bill credit for service disruptions in situations such as this that are squarely their fault. BEWARE!!!!! That’s really disappointing to hear. I got my EVO at Google I/O and over the past few days it got buggy. Enabling the bluetooth feature automatically causes it to reboot. It was PERFECT before that. I called Sprint and they said they’ll send me a replacement unit then have me mail the old one back in. Ask for a supervisor or manager. It’s unfortunate that the yours was buggy and the service reps weren’t helping. Is it completely dead? Or was it a one-time thing? But yes you are correct about high-demand for the phone. It’s selling faster than they can shelve them. That’s great for Sprint. Reply when you have a chance and if you still don’t have your problem solved, I’ll connect you to someone at Sprint who will. Skatter Tech works with them closely. Does the Wilson Electronics Sleek Signal Booster you mention in the article improve your 3G or 4G coverage? YES! Our review of that is coming soon. I’ve been testing it with Verizon, Sprint, and AT&T over the past month. My test results are almost complete. But I’ll leave you with this one scenario where it worked wonderfully. I had it setup as the stand for the EVO 4G while driving to LA from San Jose (6 hours). We had the passengers try a few speed tests during the trip both while driving and stopped in the middle of nowhere. Speeds were about 100 kbps down at one point. I enabled the Wilson Electronics Sleek, and I kid you not, speeds went up to 1000 kbps. It also kicked the phone out of roaming mode, which is free anyways, into standard coverage. If you have issues at home, work, or during drives, it’s a damn good product. Just about your comment on Sprint not having as big of a 3G network as the other two carriers, AT&T and Verizon, Sprint actually has the 2nd largest 3G network in the country, with Verizon coming in first and AT&T coming in 3rd, with T-Mobile following last. Great review. I’m deciding between an EVO 4G and a Droid X, and have gotten tired of all the cookie-cutter superficial reviews that simply list off the key features (4.3″ screen, 1Ghz, 8mp camera, etc) and don’t provide any actual reviewing of the devices. Your review provided meaningful analysis and thoughts on things like the coverage and call quality that I’m having trouble finding elsewhere. Well done. I couldn’t agree more. This really was a wonderful review. There is one thing I would like to add though. As a sprint customer I have to inform you all on what i just found. Apparently Sprint owns Boost mobile which is some kind of a prepaid cell phone service. What I found was that Sprint charges twice as much as Boost for the same cell phone service. I am a little confused. I know thi s isn’t exactly what this review was about but as sprint customers I felt compelled to speak here on the topic. Anyways I found this site http://sites.google.com/site/sprintcustomersunite/ which has the head of Sprint’s email on it. If you are mad like I shoot Mr Hesse Ceo of SPRINT/Boost an email. I almost switched from my iPhone to the EVO this evening. I was all set until the clerk at the sprint store told me I could not get calls while I was using the mobile hotspot linked to my laptop in 3G. It was possible on the 4G network but we don’t have much 4G in silicon valley yet. Go figure. Anyway, that was a deal stopper. I may switch when we get 4G. Yup, unfortunately you’t do voice + data at the same time on Verizon or Sprint. AT&T and T-mobile can. However if you have WiFi or 4G, both can work at the same time. What websites did you try to load? I’ve maybe had the browser freeze up once since I got it. Random customers may have installed bad apps on it. You can talk and use data on the 4 G connection you also can y\use 3G and talk. The only time you cannot talk is when using the mobile hotspot in 3G. having 5 devices connected to the web and making calls puts quite a load on the processor. I’ve been with Sprint for over 10 years and could not be happier. While I have not had to use customer service much I can say it has improved tremendously in the past few years as has the network coverage. I *never* have dropped calls and always have a signal. I believe Sprint roams on Verizon (2G) with no roaming charge (at least on my Everything plan). The EVO is by far the best phone I have owned. The battery could be better but Advanced task killer helped a lot. It is disappointing to hear of Des Flynn’s issue with a replacement phone. I’d escalate up the chain until they make it right. Call retentions (cancellation department) everything I’ve read is that Sprint will do anything to keep you from leaving. One last thing regarding 4G. I’m lucky to have it in Washington DC even though the official 4G announcement hasn’t been made. And while 4G is very fast in my area, 3G on the EVO is very fast too, much more so than on my old TouchPro. Nice review- nice to hear something positive about the call quality. I have an iphone 3G and am tired of apple and want to switch, but I keep getting gun shy. I really like the Droid X, but can’t justify the major jump in price to Verizon service, so it looks like sprint is my only other option. The evo looks fantastic, but I’m nervous about call quality 3G speed (OC, CA area). Any one have any good advice to an iphone customer looking to make this jump? phone works great! had it for about 3 weeks now and so far no complaints. yes battery could be better, but i mamanged to tweak the setting the right way to where battery is alot better than before. Cant go wrong with Android!! Hi guys, I also found this review quite professional, I read another review from engadget if my memory serves me well but it was not as through as this one and also it seems to be written by an iphone lover wich is kinda awkward. You should read also the Android Central too, it’s also very exhaustive and some times even funny! By the way, does anyone here knows if there’s any chance to connect an external bluetooth keyboard to the EVO? or If there’s any supported one? Also, I’m a linux user ;) Does anyone know anything about compatibility issues or support? 2. walmart sold it for $199 (also sold out) with no rebate and sprint store wanted $299 upfront with 100 mail in rebate. Not willing to price match. 3. I have a palm with an unlimited data plan for $69.99 a month. In order to buy the EVO i was told i had to have the Premium Data plan for an additional $10 (for 4G). EVEN though i don’t get 4G service I’d be paying for it!! I don’t think so. I’m not paying for a service i’m not getting. I asked the sprint rep when he thought we’d get 4G in our area (providence, Rhode Island) and he says ‘Uhm..i don’t know maybe a couple months’. So you want me to pay an extra $10 a month for an unknown amount of time for premium service that i’m not getting? Uhm..NO. The $10 is not for 4G coverage. it is a charge for unlimited 3g/4g data. HTC EVO IS A BETTER FONE AND EVERYBODY KNOWS IT! !